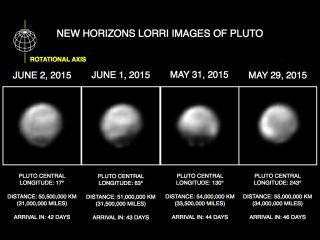 NASA's New Horizons mission reveals the changing face of Pluto. E. Dawn Redd is a 14-year-old student and the daughter of Space.com contributor Nola Redd. Like many kids and teenagers, she has grown up in a world in which Pluto has been considered a dwarf planet for most of her life. Throughout history, children have grown up under the shadow of conflict. Some lived through the Civil War, others the War of the Roses. I'm 14, and I grew up watching a different kind of battle, although this one had only one casualty: Pluto. In my home, Pluto's status as a planet is an ongoing battle. My mom writes for astronomical websites and magazines; my dad, once he has read the facts and made up his mind, is extremely set in his opinions. Both of them are exceptionally stubborn people. Their vigorous discussions form some of my earliest memories. But that changed last fall, when I discovered how much I love astronomy. I remember the exact moment of my epiphany. I was in the car talking with my mom when she mentioned that she was going to a major astronomical meeting. She said she would meet some really cool scientists. I asked her a couple questions, and suddenly I was thinking, "Maybe science isn't so boring after all." My mom brought me to the meeting that winter. I attended as an intern and absolutely loved it. After that, I started listening a little bit more to my parents when they argued their sides on Pluto. I researched the debate, learning that this discussion extends beyond our home. I ultimately formed an opinion of my own: There are good points for both sides. My dad gives several reasons to argue that Pluto is a planet. First, it orbits the sun. You might say, "But a lot of things orbit the sun! Are you saying we should classify them all as planets?" He said maybe we should. Second, Pluto has significant mass. It isn't huge, but it is pretty large; it even has its own moons. My dad said there should be a rule for planet classification that requires a body to orbit a star and have a certain mass. "It was already a planet," he said, "so why be mean and try to tell it it's no longer a planet?" On the other hand, my mom said that Pluto is definitely a dwarf planet. Yes, it is a significant member of the solar system, but it's still pretty tiny. Pluto isn't even big enough to clear its orbit of other, smaller objects. It's pretty far out in space, right on the edge of the Kuiper Belt, the band of icy rocks beyond the orbit of Neptune. She said she doesn't think that Pluto qualifies as a proper planet. It certainly fits in better with the dwarf planets. Ceres is closer to the sun than Pluto and was considered a planet when it was first discovered in 1801 but lost its "planet" title around 1850, and no one has been in an uproar about its demotion. The real question, though, isn't whether Pluto is or isn't a planet. I think the real question is, does it really matter? Pluto's status doesn't change anything scientifically, and it most likely won't affect how missions are planned. Maybe it matters, and maybe it doesn't. I think the most important thing is that scientists keep looking and learning about Pluto, and all the other bodies in the solar system. People just continue to broaden their horizons.